If you're looking for more storage space then consider a shipping container! I have a few 20ft (6m) shipping containers available ready for pickup or delivery. These units are in Cargo Worthy condition, meaning they are wind and water tight but do show signs of age including surface rust and dints. Features include double doors, timber flooring, internal anchor points and come in a variety of colours. OPTIONAL - Paint refurbishment for used containers also available on request. We also have NEW containers available, please call for a price. 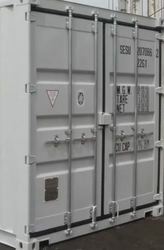 Hire options also available for new containers if you want to lease. 40ft (12m) shipping containers also available.